The number of shelling attacks rose to 54. The number of militant attacks on Ukrainian positions in Donbas increased to 54. Five Ukrainian soldiers were wounded in enemy shelling, the headquarters of the anti-terrorist operation said in the 5 April morning report. The militants were most active in the south of Donetsk Region, using 82-mm mortars to pound Ukrainian positions near Krasnohorivka and Shyrokyne, and grenade launchers and heavy machine guns in the area of Pavlopil and Vodyane. 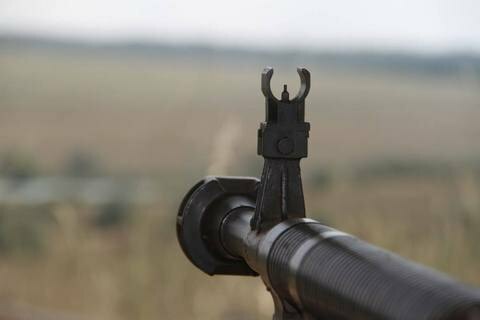 The ATO positions near Maryinka were pounded with grenade launchers, and in the area of Hnutove – with machine guns. A militant IFV fired at the positions of Ukrainian marines in the areas of Vodiane and Shyrokyne. An enemy sniper was active near Novotroyitske. Ukrainian troops thwarted an attempted act of sabotage in the area of Maryinka by a militant reco group. After a brief clash, the militants were forced to withdraw. In the Donetsk sector, militants fired at Avdiyivka from 82-mm mortars, grenade launchers, heavy machine guns and small arms. Ukrainian positions near Luhanske, Opytne, Pisky and Nevelske were under heavy machine gun fire. In the areas of Opytne and Troyitske, enemy snipers were active. It was mostly quiet in the Luhansk sector, except for several attacks with the use of antitank grenade launchers and small arms in the area of Krymske and Lobachovo. In the previous day, ATO troops reported 48 enemy attacks, two dead and five wounded.